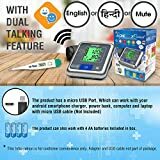 HINDI OR ENGLISH DUAL TALKING FEATURE: DR TRUST A-One Max Bluetooth Connect has DUAL TALKING Guidance HINDI & ENGLISH or MUTE mode. FUZZY ALGORITHM SUPERB ACCURACY: Advanced fuzzy algorithm to prevent over pumping and give superb accuracy Patented. 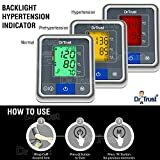 Detects Atrial Fibrillation. 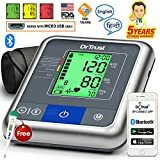 FREE FRIENDLY DR TRUST BP CONNECT APP: Dr Trust Bp Connect App - Download Dr Trust Bp Connect for FREE in Apple Store/Google Play. 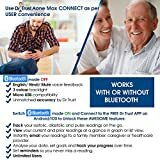 Dr Trust Bp Connect works with Bluetooth 4.0, supports Android 4.3 & IOS 6.13 or above system. 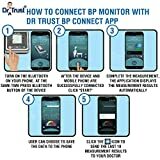 "Dr Trust Bp Connect App" connects with Bp Monitor - stores Test Reading data to app - You can add as many users as you can. PRODUCT OF USA: Approved by United States Food and Drug Administration With 5 Year Extended Warranty In India: Highest Standard Of Quality, Designed And Engineered By Nureca Inc USA. Patented Technology and Design from USA.